Jamieson Health Center - Snacks the healthy way! Don't burden your health with the effects of sweets and fast food. Enjoy some of our healthy snacks to keep your blood sugar balanced and fight fatigue and chronic issues. Some people snack all the time and some people don’t snack at all. Changing the way you snack is either a real issue or is not an issue at all. Overall, in order to keep your blood sugar nice and even, it is important to eat every 2-3 hours. And obviously this does not mean to indulge on sweets which cause insulin resistance, or eat chips and crackers which contain toxic transfats. Both raise cholesterol and lead ultimately to diabetes and cardiovascular issues. The first thing on the snacks list should be plenty of mineral water, which keeps us hydrated, is not only good for our skin, but also our digestive system and our brain. After all, humans are made of 50+% water! · Once a day: One serving of low glycemic fruit such as an apple, a few pieces of melon, a peach, a pear. We sell peanut and cocoa bars from Standard Process, because they are high in protein and very low in sugar. Other flavors are too high in sugar. Tip: although you can't have tortilla chips (always a favorite with this dip) you can enjoy a nice crudité with your guacamole by slicing up some raw vegetables (or using them whole if you prefer). 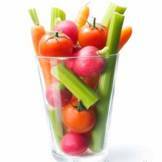 Whole cherry tomatoes, sliced carrots and celery are always favorites. Or use with beet or kale chips. stems). Wash and thoroughly dry kale with a salad spinner. Drizzle kale with oil and sprinkle with seasoning salt.